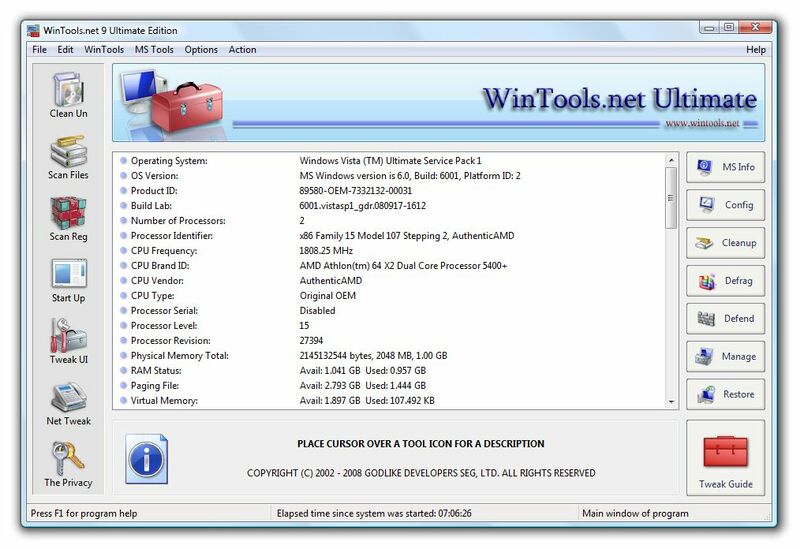 WinTools.net Ultimate Edition x64(64 bit) is a suite of tools for increasing MS Windows operating system performance. WinTools.net Ultimate x64(64 bit) cleanly removes unwanted software from disk drives and dead references from the MS Windows registry. WinTools.net Ultimate Edition x64(64 bit) puts you in control of the Windows startup process, memory monitoring and gives you the power to customize desktop and system settings to fit your needs. ...... settings to fit your needs. Adds more speed and stability for your connection. Ensures your privacy and keep sensitive information secure. Qweas is providing links to WinTools.net Ultimate Edition x64(64 bit) 11.12.1 as a courtesy, and makes no representations regarding WinTools.net Ultimate Edition x64(64 bit) or any other applications or any information related thereto. Any questions, complaints or claims regarding this application WinTools.net Ultimate Edition x64(64 bit) 11.12.1 must be directed to the appropriate software vendor. You may click the publisher link of WinTools.net Ultimate Edition x64(64 bit) on the top of this page to get more details about the vendor.